BLACKJACK: Should You Tip The Dealer? I receive many questions from blackjack players. 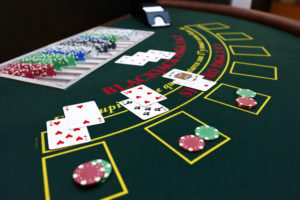 Below are a few of them with tips on how to tip a dealer, what to do if a dealer makes a mistake and what you should do if a casino oversteps the legal rights of a player. Q: Should you tip a blackjack dealer? If so, how much? A: There is no rule that says you must tip a blackjack dealer, just as there are no rules that say you must tip a waiter or taxi driver. However, let’s be realistic… we all know that many hardworking folks who work in the service industry have a low base salary and that they depend upon tips to make ends meet. When I go to a restaurant, whether I tip my server and how much depends upon the service I get. Ditto for blackjack dealers. Q: Does it make a difference how you tip the dealer? I am asking because sometimes I see players make a tip for the dealer on their hand while others just leave some chips for the dealer after they are done playing. A: I think it’s important that you let the dealer know early in your session that if she is friendly and helpful that you will be tipping her. Therefore, if she’s friendly from the get go, I’d make a bet for her on your hand (now she knows that if she continues the behavior you expect, she will probably be rewarded with more tips). However, I don’t recommend that you place the chips you want to bet for the dealer on the outside of your betting spot (most players do this). Instead, you should place the chips you want to bet for the dealer on top of your chips and inside the betting circle. The reason is if you place the chips outside of the betting circle, you have no control over them. If the hand wins, the dealer will keep the chips you bet for her plus the corresponding winning chips. If you place the chips on top of your chips inside the betting circle, you still own them, meaning the dealer only gets to keep the winning chips or whatever you choose to give to her. Usually, I let the chips that I bet for the dealer ride on the next hand. If I win a few hands in a row, it gives the perception that Iâ? ?m a big tipper. In addition, by placing the chips you bet for the dealer on top of your wagered-chips, the additional amount will count toward your rating. Q: The dealer made a dealing mistake, which caused me to lose. Her supervisor wouldn’t correct the mistake. I felt cheated and I’ll never play at that casino again. A: Normally, if a dealer makes an error in dealing the cards or in a payoff, she is supposed to bring it to the attention of her supervisor. The floor supervisor has the responsibility to correct the mistake. In most cases, the supervisor will give the benefit to the players because he wants to maintain them as customers. However, if you believe that the supervisor hasn’t corrected the mistake to your satisfaction, you should tell the supervisor that you would like to speak to the pit (or shift) boss. I would plead your case at this level, including asking the pit or shift supervisors to review the tapes of the table so they can see the mistake made by the dealer.